How to stop bleeding of toe nails cut too short. you may cut into the quick and cause the nail to bleed. 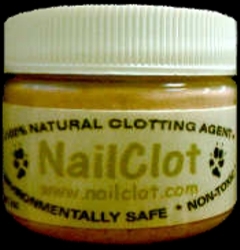 This 100% natural mineral applied will stop the bleeding quick! 100% Natural 100% Non-toxic 100% Safe 100% Pure Zeolite. When bleeding occurs, open container and pour into palm of hand. Place your pets bleeding nail into your palm, slightly pack into wound. The blood will immediately start to coagulate and clot. Keep your pets nail in your palm submersed in the powder. Stops beeding in about one to two minutes. During this time, stay calm and speak softly, soothing your pet. They have just been injured and may be a little frightened. Keep your pet from licking to allow the injury to heal. click on the Add to Cart button under the quantity you want. there needs to be any changes or information added to the shipping address.